Matias’s new line of full-sized keyboards aims to provide comfortable iPhone typing without adding more clutter to your workspace—the company unveiled three keyboards that pair to both your Mac and your iPhone at CES this week. Each keyboard in the One line has a designated button that toggles the keyboard back and forth between devices. Press the iPhone button on the top of the keyboard to switch the One from Mac to iPhone mode, where you can comfortably type on the keyboard and have the text appear on your phone. Press the button again, and you’re back to typing on your Mac. The standard Matias One Keyboard has a blue button that activates iPhone use. The standard $100 One Keyboard has an in-keyboard stand for your iPhone or iPod touch that’s positioned just above the arrow-navigation keys. It also has an onboard USB 2.0 hub with two ports, and the function keys control your iPhone’s screen brightness, navigation, volume, and audio track selection. 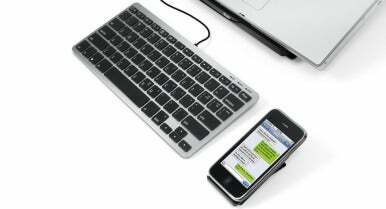 The Matias Slim One Keyboard is smaller with a detached iPhone stand. If you prefer a smaller laptop-style keyboard, there’s the $80 Slim One Keyboard. It includes the same functionality as the One, but lacks the built-in iPhone stand—instead, it ships with a Matias MiniRizer stand to mount your iPhone near the keyboard. The Tactile One Keyboard's switch button is on the lower right-hand side. The most advanced of the three is the $200 Tactile One Keyboard, which has sculpted key-tops and Alps mechanical key switches. Additionally, it has three USB 2.0 hubs and a special n-key rollover technology, which the company claims will eliminate “ghosting” for fast typists. Like the One, it has an in-keyboard stand for your iPhone. “We wanted to make sure we had all bases covered. Different people have different tastes and different needs. With these three keyboards, there’s a great option for virtually every type of user,” said Edgar Matias, CEO of Matias, at CES earlier this week. According to a Matias representative, the keyboards connect to the Mac via USB, and use Bluetooth to connect to the iPhone. Though Matias doesn't say so in its specifications, a representative confirmed that you can connect to an iPad, and the function keys designed for iPhone use will also work. Matias also said that you can connect one keyboard to two Macs—one via USB, and the other via Bluetooth. The One Keyboard line is compatible with the iPhone (3GS and newer) and iPod touch (third generation and newer). PC and Mac-specific versions the One Keyboard and Slim One Keyboard are now available for purchase. The Tactile One Keyboard is available for pre-order and will ship in May 2012. Editor's note: Updated at 8:13 a.m. PT with information about iPad compatibility.